This week I did some Improvisational sewing. and THEN cut up into bigger triangles. 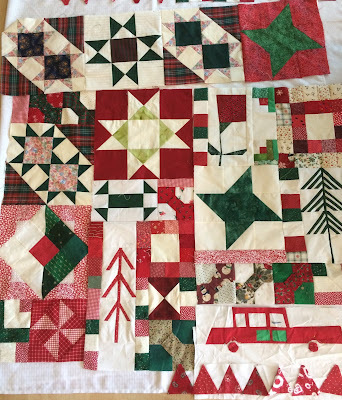 but it was a FUN experiment in Patience piecing. I also puzzled my orphan blocks into a square. 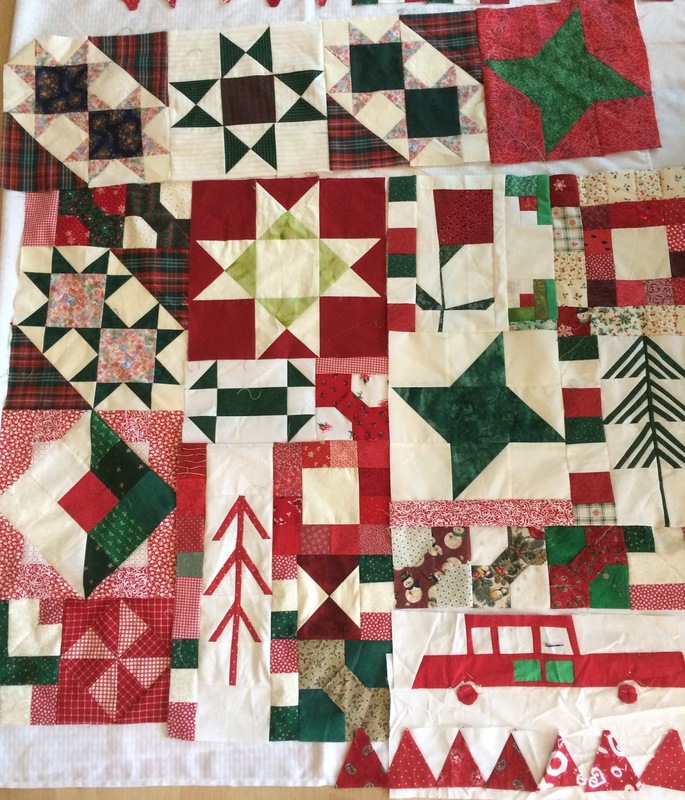 Some of these blocks are from blogland friends. and the loving quilting community! Isn't that border fabric perfecto?? and I mean JUST ENOUGH!!! There was less than an INCH left! The border fabric IS pieced. I didn't try to match up the prints to HIDE the seams! There just wasn't enough fabric to do all that fussy work. I'm making a NEW quilt! My design wall is the floor. This week I will also be working on a little sweater. There IS hope that I can do it before the cold weather is gone! I had this along with me this weekend. We visited our son in Iowa. and see a candle on a perfectly clean kitchen table!! It was a miracle actually. They DO become adults that know how to do grown up things! When they're young....you wonder if it will ever happen! I shed a few happy tears. I took a class from David Taylor last month. A class sponsored by my local guild. Most of us chose this pattern and David gave us lots of great hints on applique. I enjoyed the class and learned a lot. The pieces SHOULD fit together like a puzzle. I fudged QUITE a bit. Maybe I should teach a class on how to FUDGE!!! I added some scrappy borders to the pillow. Can you believe I didn't need to cut ANY out?? They were ALL there ready to go. LOTS of BLUES in my 2 1/2" squares drawer. I was anxious to finish it!!! Hopefully this week I'll get going on MORE HANDMADE gifts! 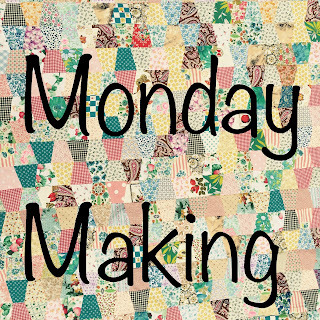 YOU are making this week!!! I FINALLY sat down and did it! and this will be my handmade gift! I love the blend of color these little runners give me. As I weave, the runner is rolled up in the loom. I use leftover strips from quilting. I enjoy the SURPRISE ending!